9 days from £3465pp plus international flights. A spectacular trip which will show you some of Zimbabwe's wonderful highlights. Your journey will start in Victoria Falls where you can visit one of the seven natural wonders of the world. This is somewhere everyone should visit once in their lifetime (if not more). Victoria Falls is also known as an adventure capital too with whitewater rafting, bungee jumping and micro-lighting on offer, fabulous fun for everyone. 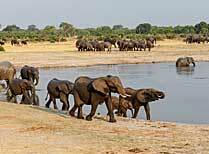 Then you will travel to Hwange National Park, home to a huge elephant population and plenty of other wildlife besides. 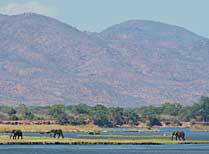 To complete your trip you will fly to Mana Pools and experience this rich and varied park. With river activities and walking on offer you will have plenty to do and see. This is a wonderful introduction to Zimbabwe and may have you wanting to come back for more. When you arrive at Victoria Falls Airport you will be met and transferred the short distance (30 mins) to the renowned Victoria Falls Safari Lodge, keep your eyes peeled and you may see some game on the way. Once you've checked in you'll have time to relax, wander round the lodge and grounds and settle in. 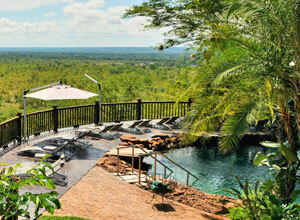 You can enjoy a refreshing swim in the pool or take up a position overlooking the waterhole and see what transpires. 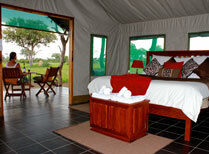 Immerse yourself in the safari feeling, relax and unwind. Today presents the opportunity to explore Victoria Falls at length. No trip here would be complete without a cruise on the Zambezi and the Zambezi Explorer offers just that. This luxury catamaran-style boat has three expansive decks where you can enjoy the views in comfort. It is located just 4km upstream of the falls. Cruise options range from sunrise breakfast excursions to a delicious lunch on board as you sail the waters or a sunset spectacles. You can expect excellent service onboard the Zambezi Explorer. A guided of tour of the falls is also on the cards for today, a chance to see this spectacular waterfall up close and personal. You will be given a brief history of the falls and your guide will be more than happy to take a snap of you with the falls in the background. Bed and breakfast. After a delicious breakfast it's time for the next part of the Zimbabwe adventure. This isn't just a road transfer or a flight, this is the 'Elephant Express'. You will be collected from reception and taken by road to Dete station, this part of the journey takes about 1hr30. Then it's all aboard the railway car that will take you on the same iconic rail line that runs from Pretoria to Victoria Falls which is used by Rovos Rail. Depending on animal sightings this journey will take approximately 2 hours along what is the eastern border of Hwange National Park, the sightings get better and better as you get closer to the Ngamo region. Guests disembark at Ngamo siding and it's a short 20 minute drive to Bomani Tented Lodge, home for the next three nights. Breakfast, dinner. You have two full days to enjoy this remote and untouched corner of Hwange National Park. The herds of elephant in the park are impressive, not to mention many other spectacular species of wildlife. The main past-time here is game viewing, be it on a guided game walk in the lodge’s private concession or on a game drive in the national park, you will not be disappointed - the varied landscapes are home to a rich array of unique African wildlife and flora. 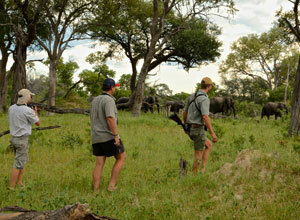 Take in the sights and smells of the bush. If you want to relax back at the lodge then enjoy the vistas of Bomani Pan from the deck. You can enjoy your breakfast while watching zebra and wildebeest quietly graze or sip your sundowner as giraffe and elephant bask in the day’s final rays. Fully inclusive. 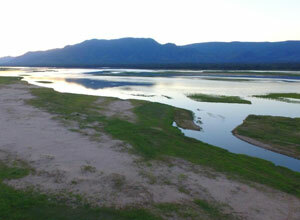 After a hearty breakfast you will be driven to the airstrip for a light aircraft transfer to Mana Pools. We recommend you keep your camera handy as you never know what you might see over and above the wonderful scenery. Travelling by light aircraft is a unique way to see the landscape and it also puts distances into perspective. On landing at your destination you will be met by a Zambezi Expeditions guide and you will have the opportunity to settle in and enjoy a sundowner overlooking the river before dinner is served. Fully inclusive. Your stay at Zambezi Expeditions will evoke a feeling of a mobile safari of days gone by. The 8 bed camp is set up on the banks of the Zambezi before your arrival and from this comfortable base you will be able to explore the surrounds of Mana Pools, a UNESCO World Heritage Site. Exploring can take many forms. 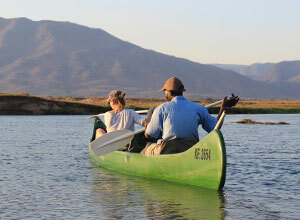 A canoe excursion on the river together with your qualified and experienced guide is a very worthwhile experience. You can try your hand at landing a fish either from the banks of the river or off an island in the middle of the Zambezi. How about tracking game on foot? A sure-fire way to get your adrenalin pumping. 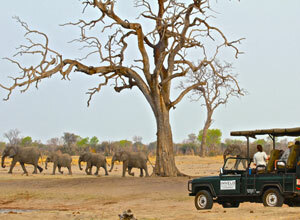 Traditional game drives are of course also on offer in the beautiful corner of Zimbabwe. Fully inclusive. Today it's time to say goodbye to the friends you have made at Mana Pools and board the light aircraft to Harare to connect with your onward flight. Flying time will be about an hour. We hope you will have some fantastic memories and photographs to take home with you and we hope you will be back one day in the future. Breakfast. 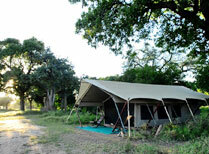 Accommodation: Victoria Falls Safari Lodge (BB), Bomani Tented Lodge and Zambezi Expeditions (FB). 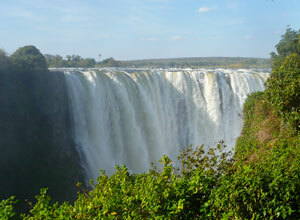 Guided tour of the falls and Zambezi River cruise included in Victoria Falls. Activities at Bomani Tented Lodge and Zambezi Expeditions, and park fees. Road transfers to and from airports and all other internal transfers between accommodation as mentioned. International flights and taxes; meals not mentioned; premium drinks at lodges; park fee increases; insurance; visas; vaccinations; personal expenses and tips. This trip starts in Victoria Falls and ends in Harare. It is possible to end the trip in Victoria Falls for an additional cost. 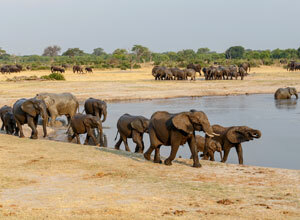 Enjoy a relaxed safari in this diverse and remote corner of Hwange National Park. 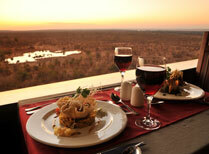 The lodge has a great vantage point over and a busy waterhole and the surrounding Zambezi National Park. A luxury mobile safari experience without having to change venue each day, all on the shores of the Zambezi River.